2.5” Pipe True Dual. 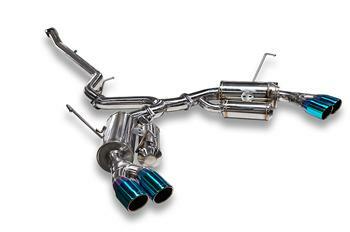 The ARK GRiP exhaust system provides the serious enthusiast a combination of sound, style, and quality craftmanship. As a leader and innovator in aftermarket exhaust systems we are highly recognized for ARK exclusive designs, proven HP/Torque performance gains, and their significant ARK exhaust note sound that is resonant, pure, rich, and deep. All of ARK exhaust systems is constructed with only high quality premium materials using state of the art equipment and technology. At ARK Performance we invest most of our time in research and development in such areas as exhaust gas flow, piping size, back pressure, inner core structure, fitment and sound by our finest engineers in the automotive industry. With their passion, dedication, experience and knowledge about cars, racing, and lifestyle they bring you the finest exhaust systems like GRiP, DT-S, and N-II. At JM Auto Sports, we take pride in delivering customer satisfaction as well as high quality performance auto parts and accessories for a total memorable experience. JM Auto Sports carries a wide range of auto parts and performance accessories, such as exhaust systems for your performance vehicle. Don’t see what you’re looking for? No problem. Visit us at http://www.jmautosports.com/ or give us a call at 855-998-8726, and chances are, we have your product. Find great prices and competitive shipping rates at JM Auto Sports today.